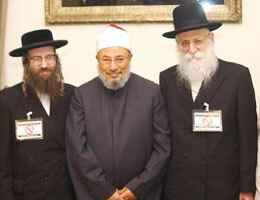 Anti-Zionist Orthodox Jews traveled to Doha, Qatar to meet with Sheikh Qaradawi. TWO Jewish rabbis yesterday called for a peaceful end of Israel saying that the existence of the "Israeli state" was contradictory to the Jewish law. 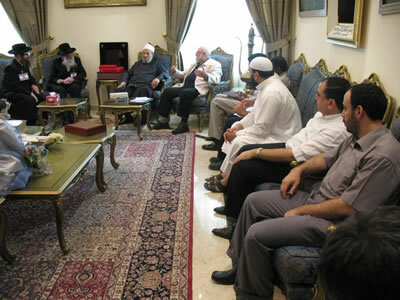 Speaking at a meeting with the Doha-based Muslim scholar Sheikh Yousuf al-Qaradawi, rabbis Ahron Cohen and Yisroel Dovid Weiss, who are activists at the Neturei Karta, a group known for its opposition to the establishment of Israel, said that the creation of Israel "was a heresy made up by the Zionists to undermine the true Jewish life". "Theodor Herzel and his friends were just heretics. They are the worst enemy for the true Jews. According to the Torah, Jews are forbidden to have a state. All Jews should refuse the existence of the so-called state of Israel which tarnished our image. We will not lose hope and dream of dismantling the state of Israel," said Weiss who called on Qaradawi at his house in Doha. "We should draw a distinction between the Zionism and Judaism. Zionism is a political movement which exploited and misled Jews and undermined the Jewish life and spirituality. I believe that the current tension in the Middle East can disappear overnight once the superpowers agreed to dismantle the Zionist state," he said. "Our hearts are bleeding for the atrocities committed against the Palestinians. It is a double tragedy both for them and us. We know that Jews and Muslims used to live together peacefully for centuries when the Muslim world was a safe haven for the Jews who fled from Spain. At that time, there were no human rights groups. However, we lived together peacefully," he said. "Muslims have no problems at all with the Jews themselves. Our main conflict is with the Zionist movement. I hope that the Neturei Karta can introduce its stance to the Arab media so that people can know that there is a big segment of Jews opposing the Zionist entity."